Interested in rare palms and cycads, but don't know where to start? Which species to get? Read below and check out our unique nursery "Free Consultation Service"
Established in 1977, Jungle Music Palms and Cycads has thirty seven years experience in helping home owners and plant enthusiasts create wonderful gardens, find rare palms and cycads, and succeed in what they are growing. Phil Bergman, the Owner, is past President of the International Palm Society and Southern California Palm Society. He is an experienced lecturer and author on the subject. He has written many articles on palm tree care. His son, Jesse, also an author and lecturer on palms and cycads, has been doing the same for over a decade. There are also several other staff members who've accumulated over forty years at the nursery. Together, they've helped thousands of people create the "garden of their dreams". There are few nurseries around with the experience of the Jungle Music staff. "MEET THE JUNGLE MUSIC STAFF". Which plants will survive in your locality? How tall do species get? Will plants block a view? Our staff at the nursery can easily answer all of these questions for you. If you want to research this on your own, we have lots of articles on these topics at this site that will answer your questions. But, we've found many people are overwhelmed with the information in this Site because there's so many species of palm plants. If you need more extensive help and a site visit to your property, we offer this service as well. We do charge for it, but someone would give recommendations of species to plant. This consultation service will guide you through your selections, garden layout and plant care. No matter which approach you choose, we can assist you and offer you the most interesting and beautiful plants on the market. 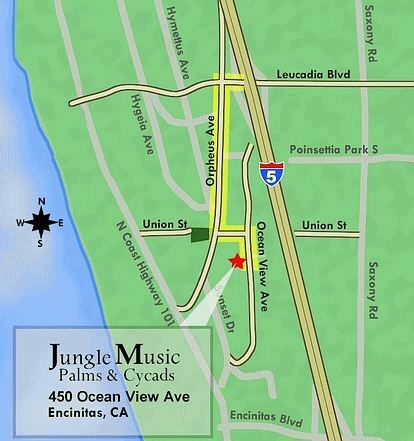 Jungle Music has one of the most comprehensive plant lists in the country. And, we can help you "slim down" your selections. We'll make sure you pick the right plants for your project. And, if we don't have what you seek, the chances are that we can locate it. If you are on a budget, we'll find things you can afford. So, we have something for everyone. It is our goal to always offer friendly assistance and service. This is not only when we help you plan your garden but also as you select your plants, load up your order or when we deliver them right to your home. Our goal is to assist you design and plant out your garden and help make it a fun and satisfying experience for you. We are located about 90 minutes south of Los Angeles and 30 minutes north of San Diego in Encinitas, CA, just minutes off the freeway 5, a few blocks from the Ocean. "Not ready to plant yet"? This is never a problem. We can hold purchased plants until you are ready for the plants. We do this all the time for customers. This gives you the time to select your plant material while the builders are working. Then, have us deliver them right at the perfect time for planting. Although there is a charge for delivery, it is available to all areas of the country. For smaller orders, we utilize Federal Express. We offer local deliveries in our trucks to most areas of Southern California. Or, if you live a long distance away, we utilize independent trucking services to quickly bring plants right to your location. A very affordable technqiue for long distance shipping is to put plants on a shrink wrapped pallet. This works well for 15g plant size. We get a lot of plants on one of those pallets. Over our 37 years, we've literally helped tens of thousands of loyal customers create their dream garden. Please read what other authorities, publications, newspapers and customers have said about us. We're proud of our reputation.